If you want your CPAP equipment to last for a long time, you need to know how to properly care for it. Regular cleaning and maintenance are very important. Fortunately, it’s also easy. All it takes is a little adjustment to your normal morning routine. The device and accessories need to be working at 100% efficiency in order to provide you with much needed sleep. For daily cleaning, get in the habit of wiping down the mask – especially the areas that come in contact with your skin. Do the wiping with a damp cloth or towel and warm water with mild detergent. Remove all of the sweat and oil on the mask that could affect the quality of performance. Gently rinse the mild detergent off with a clean towel and allow the mask to air-dry. At least once a week, the mask should be completely washed off. You must keep bacteria and dust off of it. Fill the bathroom sink up with warm water and a few drops of a mild dish detergent (ammonia-free). Swirl the parts around for a few minutes and rinse them off. Most current CPAP machines come with a humidification system that helps prevent dry mouth problems. The humidification chamber must be cleaned out on a daily basis to prevent calcification and a buildup of bacteria. When cleaning, you must first remove the chamber so that water doesn’t enter the machine. When the chamber is open, wash it with warm, soapy water. Rinse well and allow to air-dry indoors. You can also set it on a paper towel or clean cloth – just make sure you keep it out of direct sunlight. The chamber should also be soaked in a solution of ¾ water and ¼ white vinegar once a week. Let it soak for approximately 15 or so minutes before rinsing with distilled water. Never use tap water. Tubing needs to be replaced once a year or so, as tiny holes can develop over time. These holes are difficult to see, but they can compromise the proper delivery of pressure. Clean the tubing once a week. You can wash it in the sink with the other mask parts. It’s also necessary to brush it gently with a small baby bottle brush. You will want to be careful not to cut through the fragile material in between the coils. Always keep the machine and its parts out of direct sunlight, as it can be damaging. Machine accessories such as data cards and power cords may need replaced at some point to keep the equipment in working order. Never use bleach as part of the cleaning routine. Every morning, empty the humidifier chamber of unused water and replace it with fresh distilled water. Wash your face before use every night so that no oil or makeup will get on the mask. 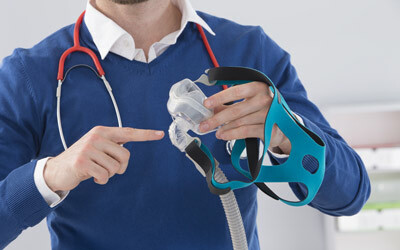 Keeping a CPAP mask in good, clean condition will keep it in good working order for a long time!